They’re not too small and they’re not too large, they’re right split down the middle. We’re talking about medium sized dog breeds! They don’t seem to get as much attention so we’re highlighting some of the cutest and most popular ones. We have medium dogs right here at Furry Babies. Take a look at our gallery of available puppies to see! In the meantime, here’s our list of 7 of the best medium sized dog breeds. We have to start with this beauty because Labs are one of the most popular medium sized dog breeds. They’re so adored and found in family homes across the country. These intelligent and incredibly friendly dogs rank high on the lovability list! Most of the time when we think about Poodles we think about the tiny ones or the larger standard poodle, but you should know there are Poodles in the medium sized dog breeds category. They have the same curly hair and witty personalities as their breed counterparts! They are downright loyal and devoted to their owners, but they are sometimes a bit wary of strangers. Aussies are striking beauties with brains and personality to match. Eskies, as they’re affectionately called, actually don’t have any ties to the Eskimos, despite their name. These fluffy pups gained their popularity in the United States as circus dogs. They would walk across tightropes performing tricks! As you can assume, they’re highly trainable. Want a sweet-natured couch potato? 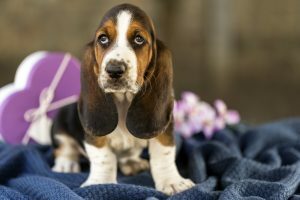 Cool, because Basset Hounds are medium dogs that will fit the bill for you! They are the smartest of the medium sized dog breeds but they are fun and have a great sense of humor! Get ready to be herded around the house with a Border Collie! These outdoorsy and active dogs just can’t help it. They’re harmless while they think they’re being helpful! Overall, they’re sweet and gentle medium dogs. We’ve save the best for last in the medium sized dog breeds category! Bulldogs are loyal, goofy, and courageous. They also snore like you wouldn’t believe! So what do you think? Have you found what you’re looking for or do you need more? Give us a call today and we’ll help you sort out your needs and meet your requirements. Don’t Give Up… We’ve Got Frenchie Pups! 5.0 24 based on 24 ratings.